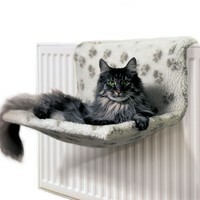 The Danish Design Kumfy Kradle provides a luxuriously cosy and warm place for your cat to curl up and rest. Suitable for holding one or two cats up to a maximum weight of 12kg (26lbs), the bed has been made out of a robust steel frame for strong support, and covered with a removable Sherpa Fleece fabric that is both soft and durable. The Kumfy Kradle has been designed for use on both water or oil filled single panel radiators, but will also fit onto double panel radiators if the gap between the two panels is at least 1.25" (3cm). The Sherpa Fleece cover is fully washable.